2. 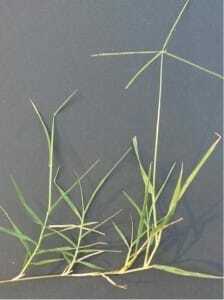 Shield walls with plant material. 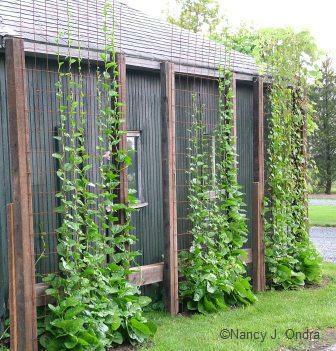 Add trellises or run wires up south-facing walls, and grow vigorous vines such as malabar spinach, chayote, or Christmas limas. The edible vines will block the sun’s intensity and shade your walls at the same time as they provide you with summer food. 3. Acquire shade netting to cover your garden. I tried this three summers ago and I love it! Large-scale netting is not terribly expensive. I used homemade trellising to suspend it high above my veggie garden, and beneath the netting it was perhaps 10-15 degrees cooler. My veggies loved it, my soil stayed moist longer, and gardening was altogether pleasant for me, even on the hottest days. Beneath the netting, shift to “waffle gardening” practices to retain and infiltrate your irrigation water. For shade netting, see Bountiful Gardens and other sources. 4. Build cheap deep-watering equipment. A 5-gallon bucket with a hole drilled in the side, 1/2inch from the bottom, makes a great deep-watering container. We made lots of them from old kitty-litter containers when we established the Emerson Avenue Community Garden. Slow deep-watering allows the water to penetrate deeply, reduces water loss to evaporation, and trains your plants’ root systems to be more drought-tolerant by diving deep. A pricier option: you can also look into traditional olla gardening. Either way, don’t forget to apply thick, thick layers of mulch. 5. Get in the habit of bucketing. Greywater might still be illegal, but that water which runs from the showerhead as you wait for the warm water is good, fresh, potable water. Collect it in a simple bucket and use it for anything — washing floors, flushing toilets, watering continer plants on your balcony, or filling those deep-watering buckets mentioned above. To get totally inspired about greywater, see the Greywater Guerillas (video). Challenge yourself to use water several times before it leaves your property. 6. Slay the fire-breathing energy dragons. It’s a general energy-saving practice to look around your home or office and hit the “kill” switch on any items which are on all the time (TVs and stereo equipment, battery chargers, etc.) But as these dragons burn energy, many of them generate lots of undesirable heat. They heat up your home or office, even while you are trying to cool the room down. On hot days, turn off your computer whenever possible. In our kitchens, since ineffiency of conventional cooking equipment heats up your kitchen, consider cooking dinner outdoors, with a solar cooker which cooks like a crock pot. Here’s my fold-up solar cooker model. 7. Start installing rainwater harvesting for next year. Your roof is a huge water-collection device. Direct downspouts into infiltration pits. Dig swales and berms. Make rain barrels, or buy tanks if you can afford them. Look to the Australians, who have been doing this for years. Brad Landcaster has some excellent books which are perfect for the direction So Cal needs to go. Treat rainwater as a valuable asset rather than a waste product. 8. Locate “cooling centers” before you need them. Here in L.A. many public buildings such as libraries are designated cooling centers that will be air conditioned, even if your home or apartment doesn’t have a/c. Here is how to cool your beer without electricity, a.k.a. the “flowerpot fridge” And, although it’s not completely power-free, here’s how to make a low-tech swamp cooler. Meanwhile, learn the signs of heat exhaustion so that you can recognize it and help people around you.